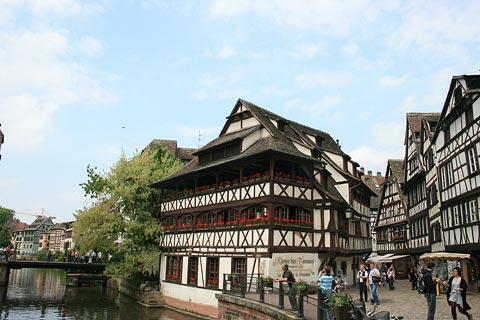 Strasbourg is the capital of Alsace, and is a beautiful city with a great deal of architectural and historical heritage to admire - certainly one of our favourite French cities. It is also the home of the European parliament. It is on the banks of the Rhine River, on the French border with Germany. The historical centre of Strasbourg is classified as a UNESCO World Heritage Site, and was the first city in France to be so honoured. 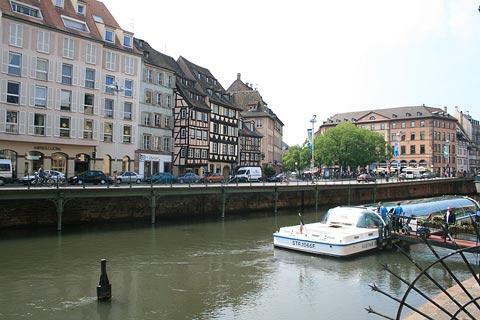 See the history of Strasbourg. 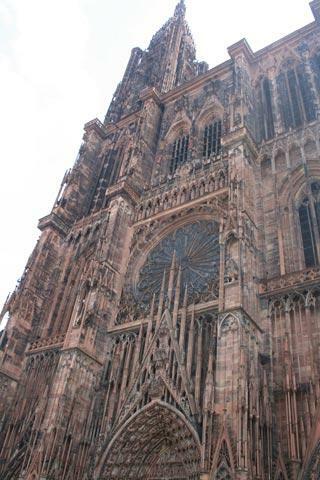 The highlight of a visit to Strasbourg, and a good place to start exploring, is at the Cathedral of Notre-Dame. This is a splendid gothic building and instantly recognisable landmark visible from all over the town due to its high spire. 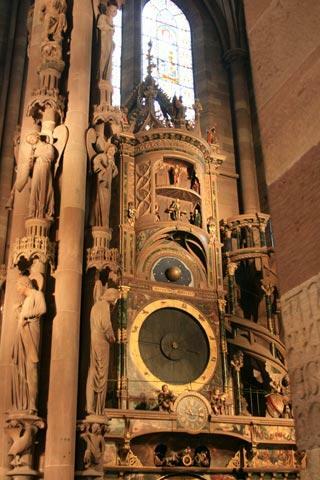 Inside Strasbourg cathedral you will notice especially the great array of stained glass windows, covering various epochs from the 12th to the 14th centuries; the highly ornate carved doorways, and the astronomical clock. 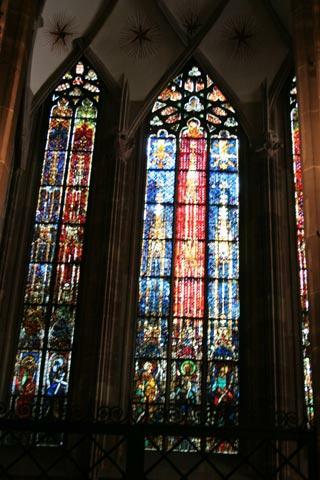 See Strasbourg cathedral for more information. 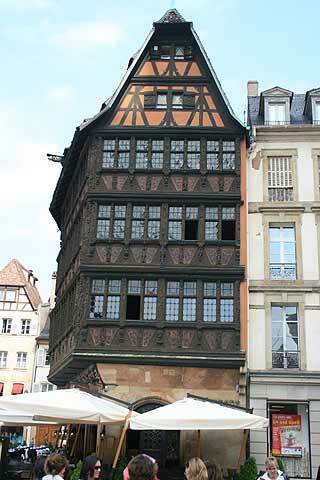 Close to the cathedral (next to Strasbourg tourist office) don't miss the particularly impressive medieval building at Maison Kammerzell, with a great deal of detailed work in the timbers, and the oldest pharmacy in France. The Maison Kammerzell was built in the 16th century and was originally home to a wealthy cheese merchant. The most interesting historical centre of Strasbourg is around the cathedral, and in the quarter known as 'Petite France', an impressive region with many beautiful renaissance style houses, often with flowers tumbling from windows and balconies, and pretty bridges across the River Ill.
One of the most impressive houses in the 'Petite France' area, though really they are all beautiful, is the 'Maison des Tanneurs'. This area was originally inhabited by fishermen, millers and tanners: you can see which houses belonged to the tanners because their roofs have open galleries where they traditionally hung their skins out to dry. 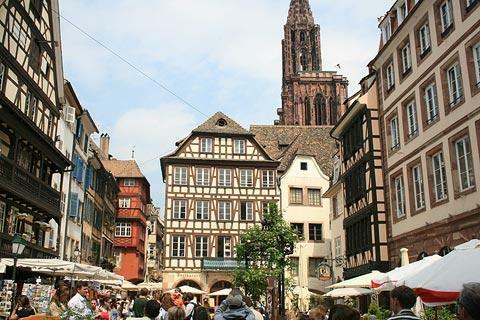 This area of Strasbourg also has a wide selection of restaurants if you are looking for an attractive place to stop for lunch. Stroll a little further along the river and you reach the covered bridge called 'Le Pont Couvert', fortified with towers. This bridge was built betwen 1200 and 1250 and originally covered by a tiled roof - hence its name. Many of the postcards of Strasbourg have this attractive bridge in the foreground and Strasbourg and the cathedral behind. Next to the covered bridge is the Vauban barrage designed by France's famous military architect Vauban. Other highlights of a visit to Strasbourg include the Rhine Palace, the Place de la Republique with large impressive Gothic and Renaissance buildings including the Theatre and the National Library and the Place Kléber. 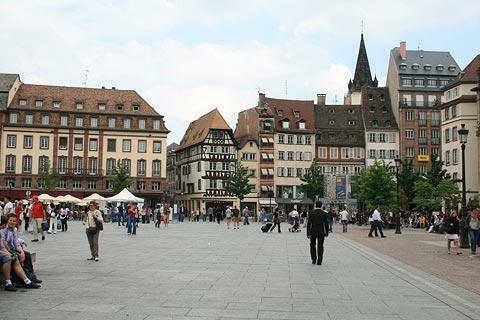 The main shopping area is around Place Kleber and Place Gutenberg. 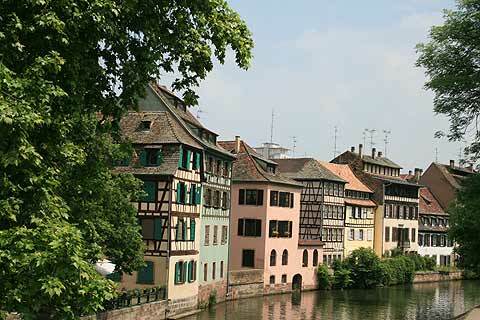 Strasbourg has several parks with the Parc de l'Orangerie and the Parc de la Citadelle being two of the best. 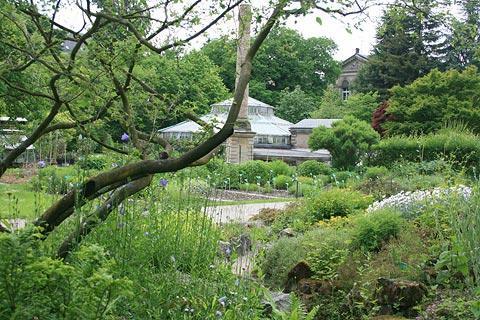 You should also visit the Botanic Gardens in the university area and the Jardin des Deux Rives. 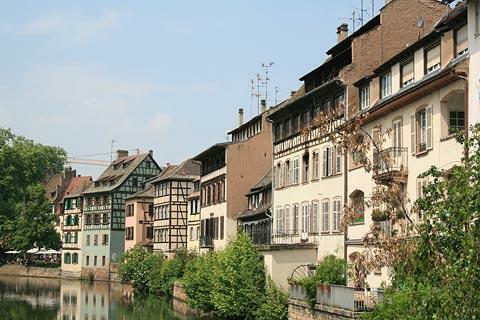 The Jardin des Deux Rives is on both sides of the River Rhine and was a project between Strasbourg and Kehl in Germany (on the other side of the river) to mark the friendship between the two countries. 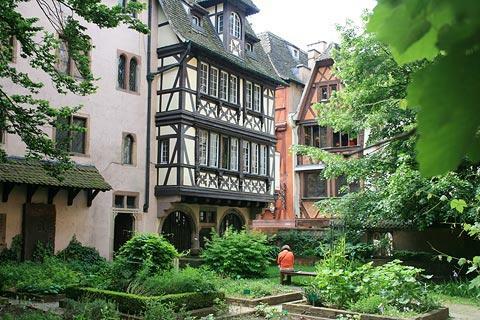 There are also many churches to discover, and other small palaces and castles, tucked away in lost corners of Strasbourg. There is a great deal to discover and love in this fine city so allow plenty of time for your visit! 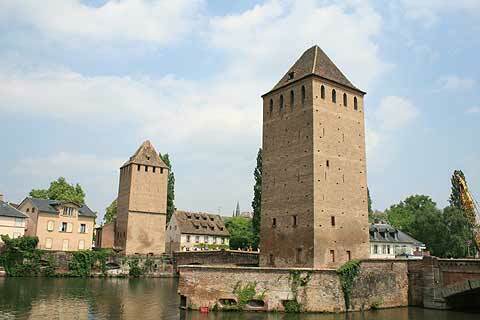 As well as all these attractive historical sites Strasbourg has its ultra-modern side. Take a tram to the site of the 'Institutions European' with the European Parliment building and the Court of Human Rights designed by Richard Rogers in the shape of a ship on the rivers edge. There is an interesting museum displaying works from the cathedral called the Musée de l'Oeuvre Notre Dame. Those with an interest in technology should visit the Museum Le Vaisseau, a museum of science and technology, and the famous Suspended Bridge. The Archaeology Museum and the Museum of Decorative Arts are both to be found in the Rohan Palace (designed by Robert de Cotte). 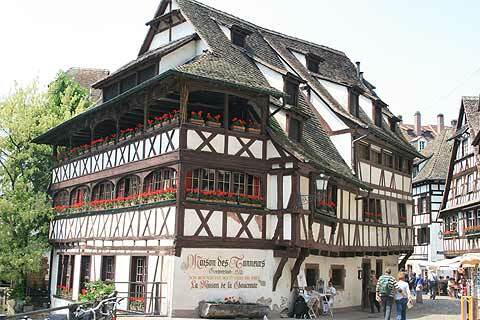 Other important Strasbourg museums include the Museum of Alsace and the Museum of Contemporary and Modern Art. 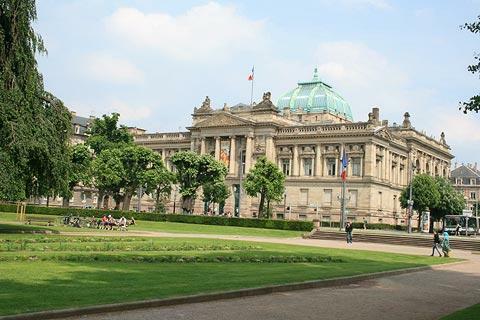 See Strasbourg Museums for more details. 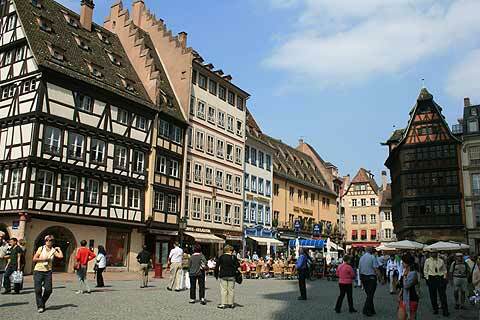 For gourmets Strasbourg offers a great chance to taste some excellent examples of both Alsatian and French cuisine. Alsatian cuisine is famous for its meat dishes, such as 'baeckoffe', a stewed meat dish, pigs feet braised in wine, and also some cheeses, like “Munster” or cakes made of white cheese. Also of course choucrote is very popular. You can also enjoy the classic wines of Alsace such as the Pinot Blanc, Riesling and Gewurstraminer. 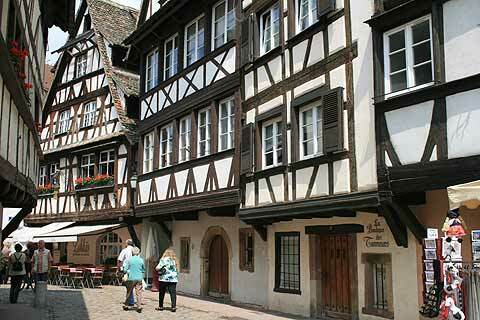 As well as visiting Strasbourg, visitors will want to explore some of the lovely countryside and picturesque villages nearby: see the Alsace Wine Route for details of a popular tourist route that starts to the west of the town.